Before every company executive sits down to write a blog, pull together a slideshow, or provide data for an infographic, marketers must come up with an overarching strategy for their content marketing initiative. Without this, consumers will see a scattershot approach that doesn't fit with your organization's messaging – and they'll miss out on the opportunity to learn more about your business. Do it well and you'll have forged the foundation for real connections between the faces of your org and your customers, separating yourself from competitors and producing a return on your content marketing investment. Given that so many companies today use content marketing, how can you rise over your competitors? How can your content sparkle, capturing consumers' eyes (or ears), versus the virtual noise of paid and unpaid content filling the Internet and mobile devices? 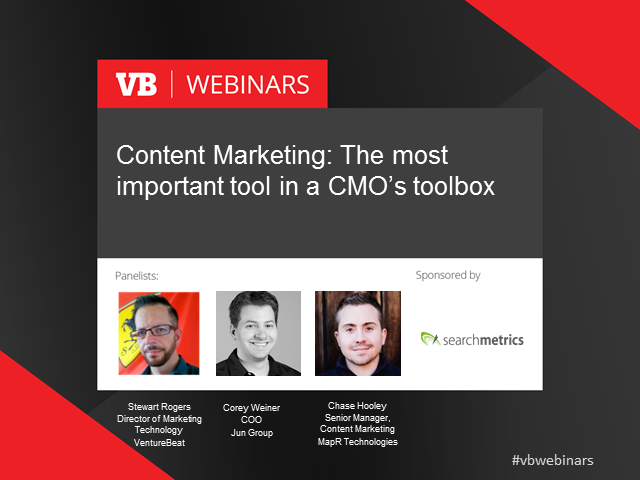 • How to determine the ROI of content marketing, plus the tools and metrics to use. This webinar will be based on Stewart Rogers' VB Insight report, which will be published in February, 2016.